The University of La Verne welcomed former Israel Ambassador to Ethiopia Asher Naim last week. 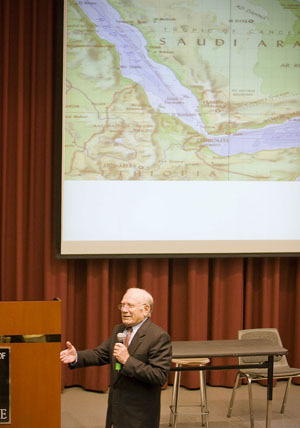 Hosted by the International Studies Institute, Naim delivered a powerful lecture about Jews in Ethiopia. “This is one of those days where we have the opportunity to welcome an ambassador to campus,” Uni­versity President Stephen Morgan said. Naim’s presentation began with an in-depth description of the history of Jews in Ethiopia. He spoke of Ethiopia’s integration of both the Jewish and Christian faith, and how the Ethiopian Jews faced isolation. “What kept them together was their faith that God promised to fly them under the wings of the eagle from Ethiopia to Jerusalem,” Naim said. Naim’s noted act of humanitarianism was launched on May 21, 1991, with Operation Solomon. After 41 flights, 37 airplanes and 25 hours, 14,200 Ethiopian Jews were evacuated from Ethiopia to Jerusalem. This act of humanitarianism was not an easy one to accomplish. Naim had to accommodate 30,000 Jews, as well as negotiate a price of $35 million with an Israeli diplomat to launch their migration. “I’m from the Middle East. You say 100, I say 10,” Naim said in regard to the negotiation. The expected 15,000 people doubled, as 30,000 Ethiopian Jews arrived at the Ethiopian embassy, where they were to begin their migration. “Gentlemen, wake up. The eagles have come. We’re taking you to Jerusalem. They looked at us like it was a revelation from God,” Naim said. “It’s the first time in history, ever, that black Africans were taken out of Africa, not for slavery, not for exploitation, but for love. This is what Israel did in the 21st century,” Naim said. Naim has since then dedicated himself to the advancement of the Ethiopian Jews, along with their integration into the Israeli society. The success of Operation Solomon prompted a lifelong dedication to the Ethiopian Jews. Naim has founded the Scholarship Fund for Ethiopian Jews, where eligible Ethiopian Israelis are granted scholarships to advance their education. After the lecture, Naim was open to questions. He brushed upon his stance on the Hamas/Israeli conflict,where he held that their differences should be addressed accordingly, and spoke of how the Ethiopian Jews are currently being integrated socially in Israel. After his lecture, Naim spoke of the satisfaction he has achieved. The audience was receptive. He was given a standing ovation and even stayed a while after to speak with students and faculty. “I thought it was pretty enlightening. I thought it was a good example of humanitarianism work – airlifting Ethiopian Jews and taking them to Israel,” Michael Quesada, senior history and political science minor, said. Naim now lives in Jerusalem and has been named the 2009 recipient of the Raoul Wallenberg Award. The award is named after a Swedish businessman who saved the lives of 100,000 people in Hungary in 1944. The honor is rewarded to people who partake in nonviolent acts of humanitarianism. Marla Bahloul can be reached at marla.bahloul@laverne.edu.